tabletop fountain. Available in several materials. office area in which they are placed. 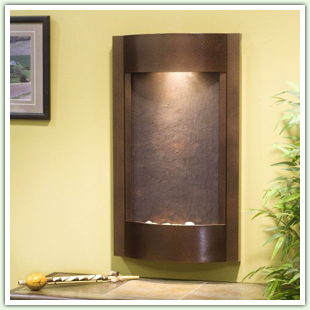 create a focal point in your room with a floor fountain. 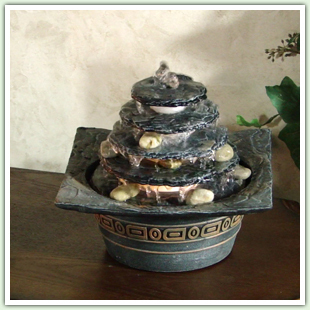 Indoor fountains bring a soothing ambiance and beauty to any home or business. 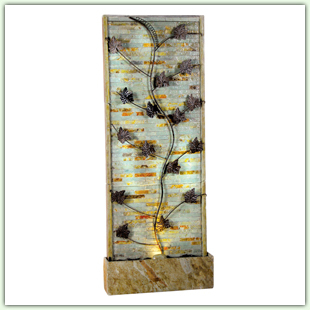 Whether you’re looking for a wall mounted, floor standing or tabletop model, Serenity Health’s water features are sure to add value and beauty to any interior setting. 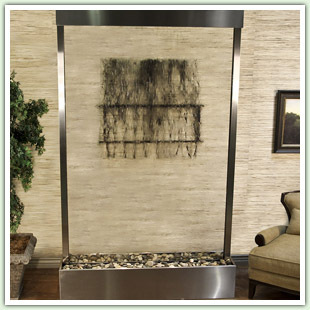 Indoor waterfalls and fountains bring a special ambiance to any room they are placed. One of the many benefits is the soothing water sounds it creates helping to melt away the stresses of your day and relax you. An interior water fountain can also help spruce up the decor of any room by adding beauty that compliments your home. Interior Designers have been using water features like fountains and waterfalls for years inside homes. Water makes people come together and truly provides a sense of calmness. You’ll never want to turn your fountain off and your new decor will make whatever room it is placed the favorite room in the house! Whether a small indoor fountain or a large interior waterfall, you will be amazed at how striking it will be in your home!